Here is a link to a few other CSAs in Lancaster County besides my favorite, Blue Rock Farm. This is by no means a complete list, but there are resources where you can get more information. This one is Farmers’ Friend. Another is the website of PA Buy Fresh Buy Local, and if you “Google” Lancaster County CSA you will find others. Here is a quick link to a few. I haven’t tried any of them out, Blue Rock is my first venture into CSA. I’ll keep you posted. 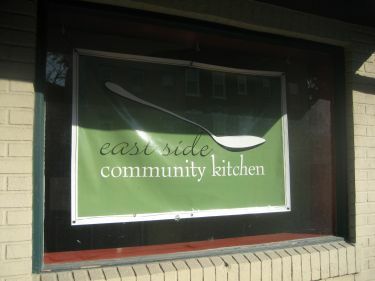 It is called the East Side Community Kitchen, located at 347 North Plum Street in Lancaster. Those who wish to use the kitchen are required to join the community as a member. The fee is $40.00 per month, which includes two hours of kitchen use, which can be banked up to 12 hours. In other words, you will be billed $40.00 each month, but on a month in which you do not use the hours, they can be rolled over into the next month, until a maximum of 12 hours are saved. Additional hours are billed at a rate of $20.00 per hour. The kitchen has virtually all the equipment one might need; members are asked to bring their own ingredients, any special equipment they might need, and extra paper towels and trash and garbage bags occasionally, as an in-kind contribution to help reduce costs. Members are also required to clean up after themselves in a manner congruent with the requirements of a commercial kitchen. In my last post I waxed poetic about the Blue Rock Farm in Willow Street. Now, Caitlin Brady sends me this recipe for a sweet and tasty chocolate cake made with chocolate and beets. It’s incredibly rich, and you may never go back to “normal” chocolate cake again. Place a rack in the center of the oven. Preheat oven to 350 degrees F. Wash beets under running water, and trim their leaves. Place clean beets in a piece of foil and drizzle with just a bit of vegetable oil. Seal foil and place on a baking sheet in the oven. Roast until beets are tender when pierced with a knife, about 1 hour. Remove the beets from the oven and allow to cool completely. Using a box grater, grate the peeled beets on the ﬁnest grating plane. Measure 3/4 cup of grated beets for the cake and 2 tablespoons for the frosting. Set aside. Use butter to grease two 8 or 9-inch round baking pans. Add a dusting of ﬂour to coat the pan. Set pans aside while you prepare the cake. In the bowl of an electric stand mixer, cream together butter and sugars. Beat on medium speed until pale and ﬂuffy, about 3 to 5 minutes. Beat in eggs, one at a time, for one minute after each addition. Stop the mixer and scrape down the sides of the bowl as necessary. Once eggs are incorporated, beat in beets and vanilla extract until thoroughly combined. In a medium bowl, whisk together ﬂour, cocoa powder, baking soda, baking powder, and salt. Add half of the dry ingredients to the butter and egg mixture. Beating on low speed , slowly add the buttermilk. Once just incorporated, add the other half of the dry ingredients. Beat on medium speed until milk and dry ingredients are just incorporated. Try not to overmix the batter. Bowl can be removed from the mixer. and mixture folded with a spatula to ﬁnish incorporating ingredients. Cake batter will be on the thick side… not pourable. In the bowl of an electric stand mixer, beat cream cheese for 30 seconds, until smooth. Add the butter and beat for another 30 seconds, until well combined. Beat in the beets. Add the powdered sugar, vanilla extract, milk, lemon juice, and salt. Beat on medium speed until smooth. Refrigerate the frosting for 30 minutes before frosting the cooled cakes. To assemble the cake, place one layer of cake on a cake stand or cake plate. 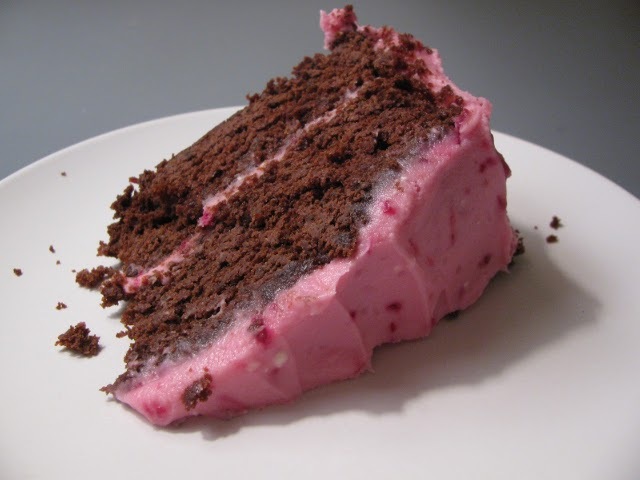 Top with a generous amount of pink frosting. Spread evenly. Place the other cake on top of the frosting. Top with frosting. Work frosting onto the sides of the cake. Refrigerate for an hour before serving. Welcome to Jeff’s Kitchen. Inspired by friends who have sampled my cooking and by my years working at the famous gourmet shop in South Beach, this is the place to post those fabulous recipes we all know and love, along with a picture, a story, an event, a person, place or thing, or whatever you feel the need to unload. The operative piece of equipment here is your brain, a saute’ pan, a piping bag, and the desire to make the world better because of the food you prepare with your own two hands. Don’t just post, tell me a story. Tell me where you found the recipe, tell me what appeals to about it, tell me who you dazzled with your best moves in the kitchen (or elsewhere–as long as food is involved). I’m not just the best virtual chef you know, but also a pretty good storyteller. But I want to know yours. I do like stories with my recipes, and storytellers in the kitchen. Join me in the fun. 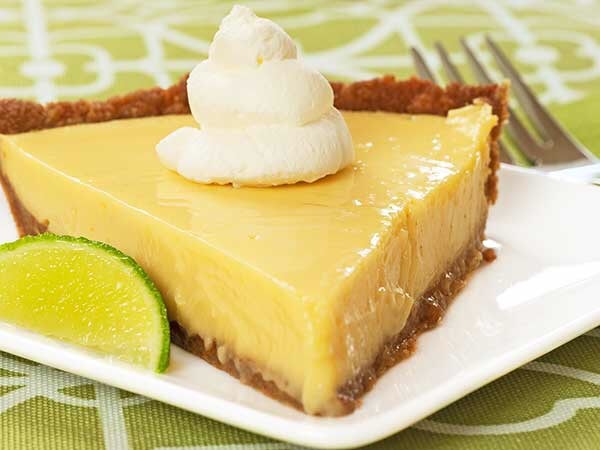 And if this isn’t enough to whet your whistle, Here’s the best damn Key lime pie recipe on the planet. I got this from an old guy who ran a donut shop on KeyLargo, and on any day, between the hours of six and ten a.m., he sold more Key lime-filled donuts out of his rundown shack on the southbound side of A1A than all the donuts sold at the local Dunkin’ Donuts down the road. With his assistance, we turned this recipe into a world-famous pie, which we’ve been selling at our place, and at a world-famous South Beach crab house, for more than fifty years. The pie has become the signature dessert for that crab house. It’s our recipe. We made it for them. To use with their own name attached to it. And I saw it on Food Network on cable. So make it yourself. And then, write me. Tell me the story about the results. That’s what Jeff’s Kitchen is all about. Let’s share our best recipes and make this the coolest food place on the planet. Or any planet. 2-14 oz. cans sweetened condensed milk. you can use fat-free SCM if you must, but PULEEZE!!! 2. For the crust, combine the cracker crumbs, chopped nuts, sugar, and butter in a 9-inch spring-form pan. Pat firmly and shape the crust on the bottom and a half-inch up the sides of the pan. 3. Bake for 15 minutes or until the crust begins to brown on the edges of the sides. 4. Allow the crust to cool to room temperature before resuming the recipe. 5. Combine all of the filling ingredients until they are well mixed. Pour into the crust. 6. Bake the pie for 15 minutes. Remove from oven and cool to room temperature. 7. Smooth plastic wrap onto the cooled filling, and freeze the pie for at least six hours, and preferably overnight. 8. Remove the pie from the freezer 15 – 30 minutes before serving. NO MORE!!!!! 9. Serve with a big dollop of fresh-made whipped cream. DO NOT USE READY WHIP OR MERENGUE. PLEASE! !